There’s nothing quite like standing at the top of the multicoloured cliffs that Santorini is famous for. This island is one of the most unique destinations in the world, and not just because it’s in the huge crater of a volcano. 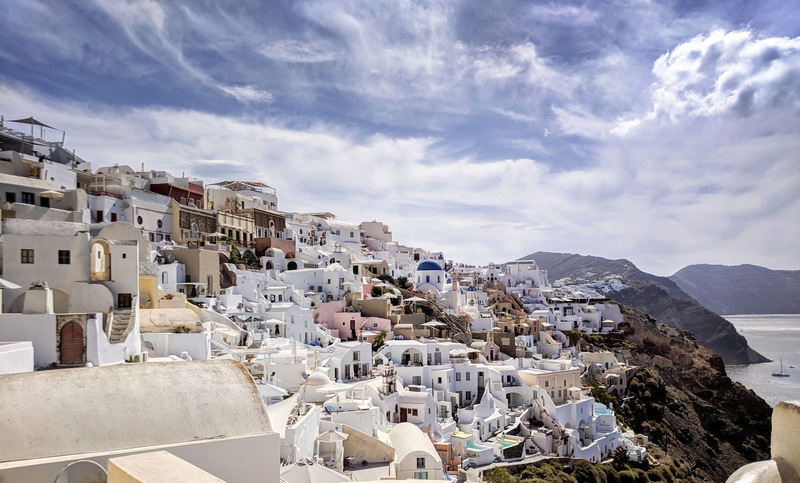 The scenery here seems crafted by the Greek gods: whitewashed villages crown the island with views over its sea-flanked edges, rural vineyards span huge stretches inland and the beaches are black, red and out of this world. There’s plenty for explorers, foodies and culture vultures to discover, from archaeological sites to swimming spots and, of course, friendly hotels, brilliant wine and Mediterranean food. What is it? Tucked in the lower part of Oia, Ammoudi Bay is a tiny fishing village with a charming little dock. 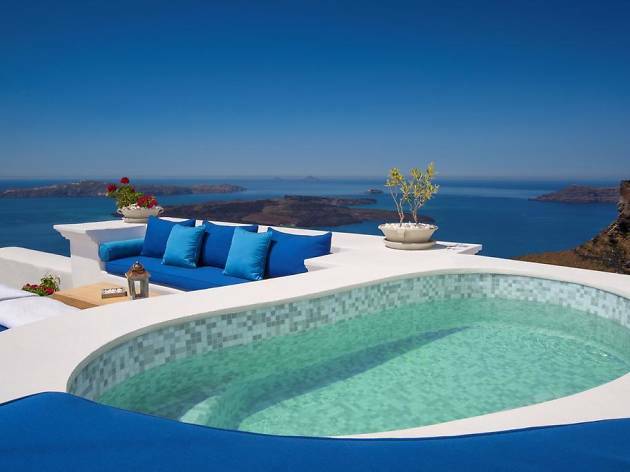 The water here sparkles deep blue and light turquoise – it’s holiday-brochure perfection. Why go? 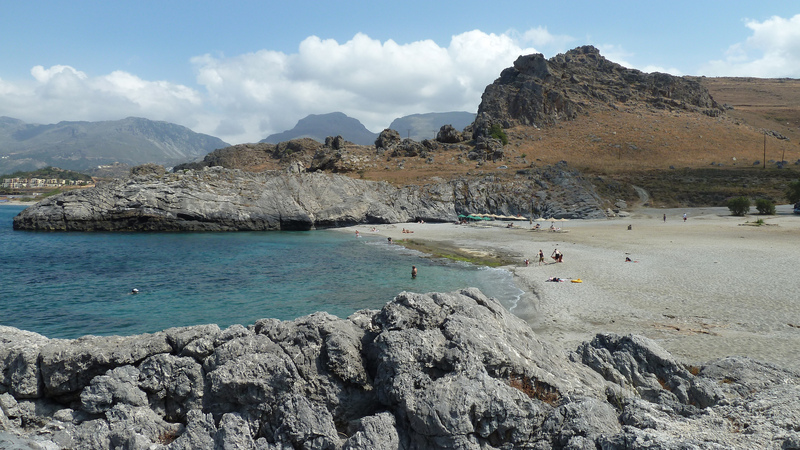 The craggy coves here are perfect for a refreshing swim between sea rocks. It’s also one of the best places to find traditional Greek seafood tavernas, including the traditional Katina’s Taverna, where the tables are set just inches from the sea. What is it? Known as the ‘Greek Pompeii’, Akrotiri is a wonderfully-preserved archaeological site where visitors get a glimpse of life on the island around 1450 BC. Why go? Like the famous Pompeii, a volcano erupted, and the layers of ash ended up preserving the settlements nearby. Today, the covered site’s panelled pathways take you on a journey between small homes, clay buildings, and artefacts which give a glimpse into what was like for the ancient Minoan civilization when it was at its peak. What is it? This is one of the most unique beaches in the world, aptly named for the unique colour of its sand. Why go? Much to many visitors’ surprise, Santorini’s beaches aren’t fringed with tropical palms or laden with powdered, gold sand. 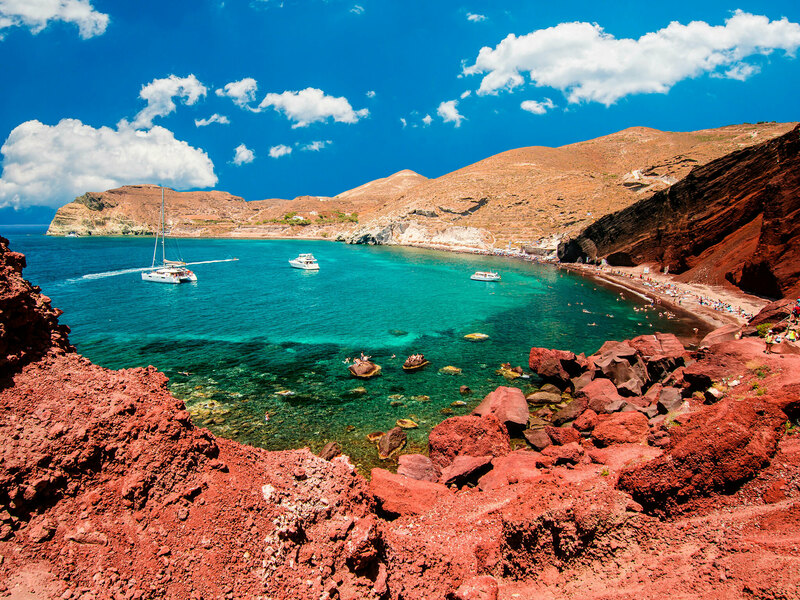 This volcanic island gave birth to a spectacle of uniquely-hued landscapes and the Red Beach is one of them. It’s named after the rusty reddish tones of its sand, and the dramatic amber cliffs that dip into it. 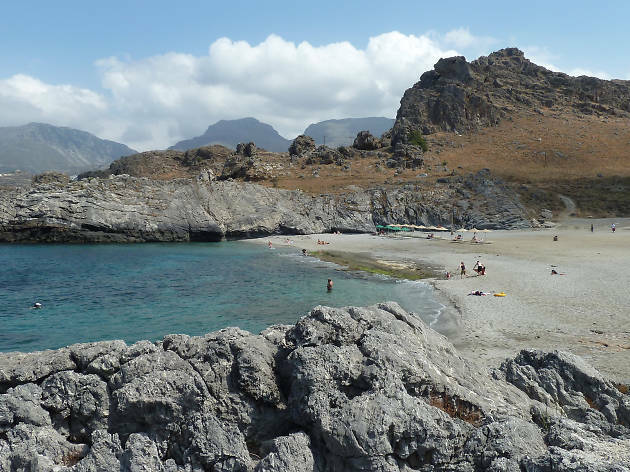 The island also has black and grey sand beaches on the east coast including Perissa, Perivolos and Kamari. All show off the amazing things that nature can do. What is it? 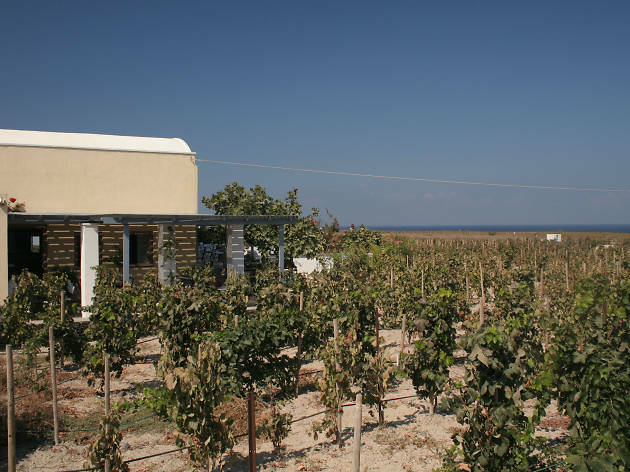 One of a number of boutique wineries on the island, which produce some of Greece’s top wines. Why go? To taste the incredible impact that growing grapes on volcanic soil can have on wine production. 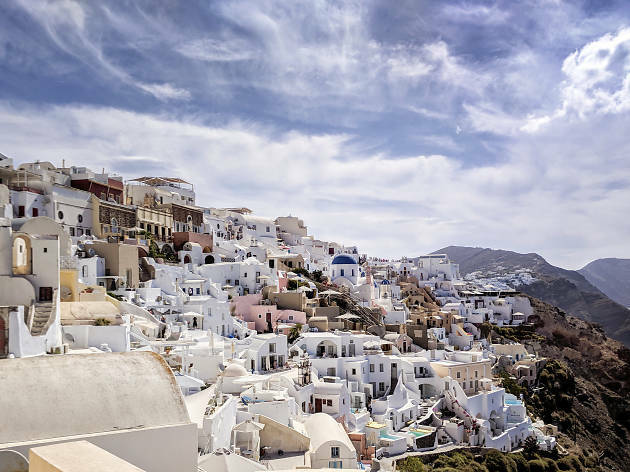 Santorini happens to be one of the oldest wine-producing regions in the world. 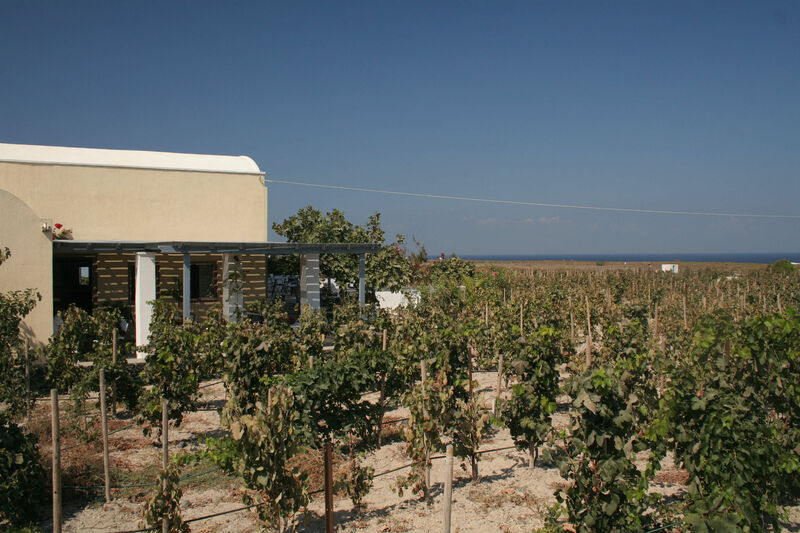 At the Sigalas Winery, a private sommelier can take you on a tour of vineyards that continue to harvest grapes with the ancient koulara technique – vines woven into basket-like forms. What is it? 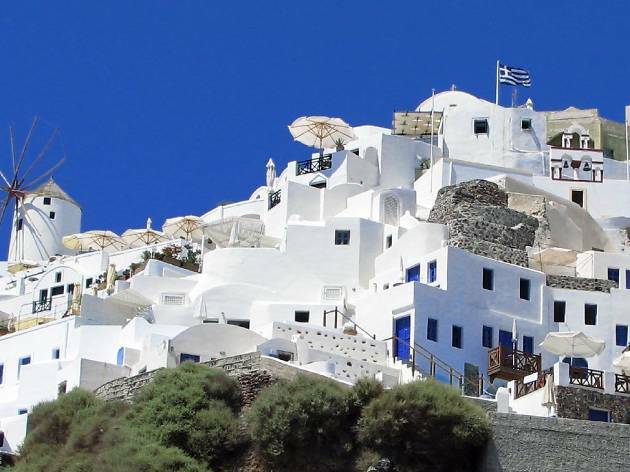 The whitewashed towns that crown the steep cliff tops (calderas) of Santorini are one of this volcanic island’s most distinguishing features. Why go? 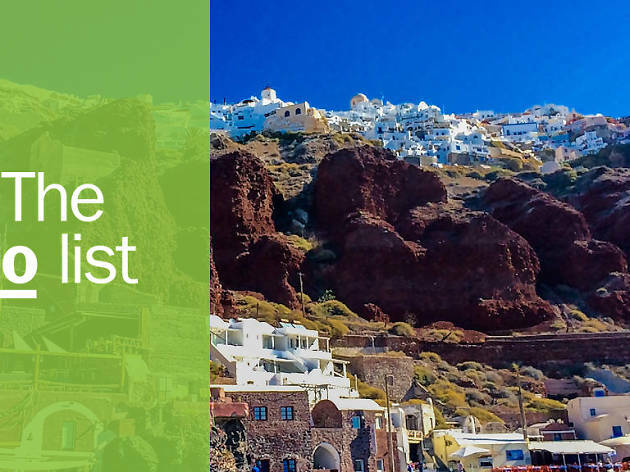 The sight of Santorini’s caldera towns – like white icing spilling from the island’s soaring cliffsides – is worth exploring by foot. 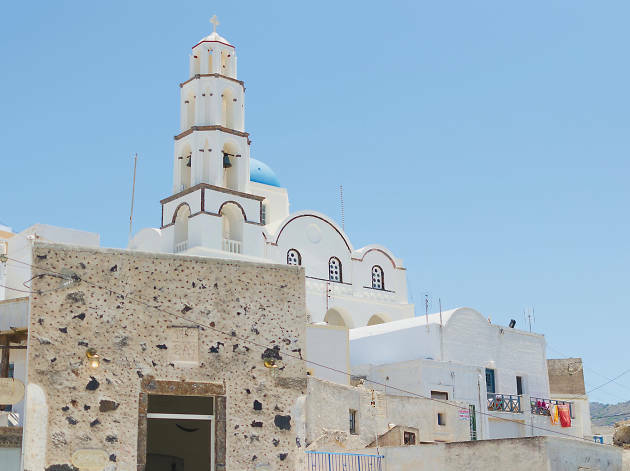 Oia, Imerovigli, Firostefani and Fira each feature brightly whitewashed buildings and churches that create a string of white across Santorini’s clifftops, offering the most incredible views in an almost surreal setting. What is it? This scenic hike is quite possibly one of the most beautiful in the Mediterranean. Why go? 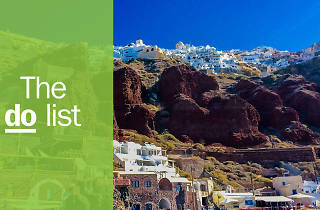 For one of the most unique trekking experiences on the Greek islands, follow the island path carved out between towns Fira and Oia. 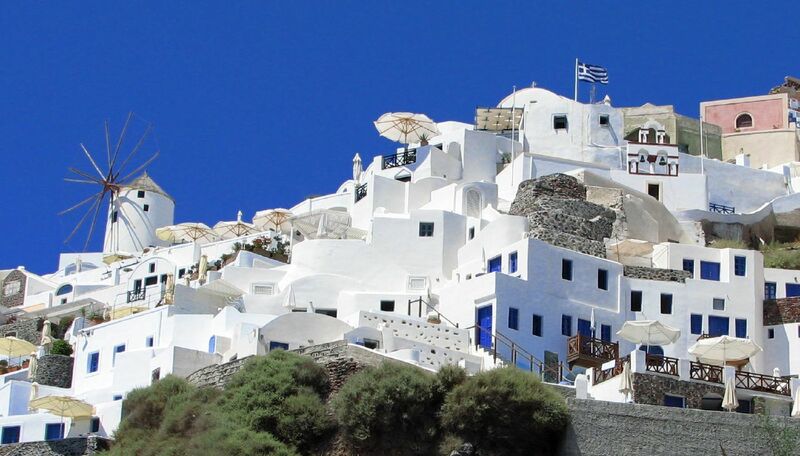 Known as the Fira-Oia Hike, it runs across the cliffs and through the villages of Fira, Firostefani and Imerovigli. The hiking trail spans under 10.5km and along the way, you’ll find yourself in amazing Instagram-worthy spots. It’s a good climb in both directions and can be challenging, especially under the summer sun. What is it? 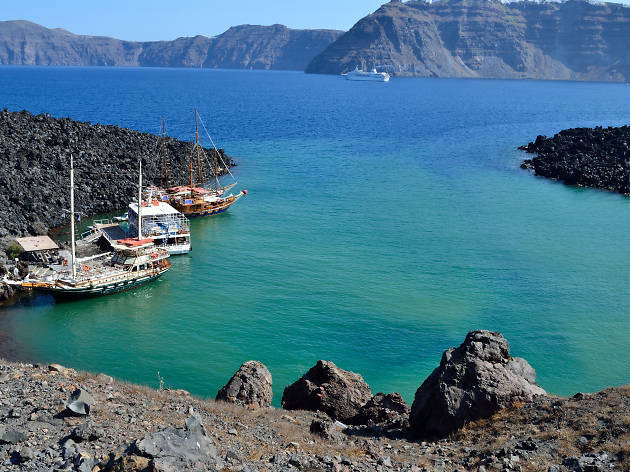 When visiting Santorini, you can sail right into two tiny volcanic islands called Nea Kameni (New Kameni) and Palea Kameni (Old Kameni). Why go? Jump off the boat and splash right into the sea to feel the therapeutic effects of steaming hot sulfur springs. Reach shore and lather yourself in thermal mud known for its healthful effects on the body. Tours also take guests to the Geological Park of Nea Kameni where you can get a close encounter with the volcanic crater (and see some stunning views). What is it? 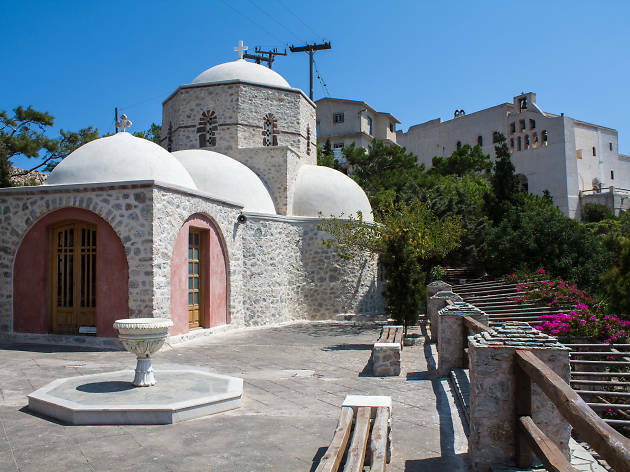 Standing proud at the highest point of Santorini, you'll find the chapel of Profitis Ilias. Why go? 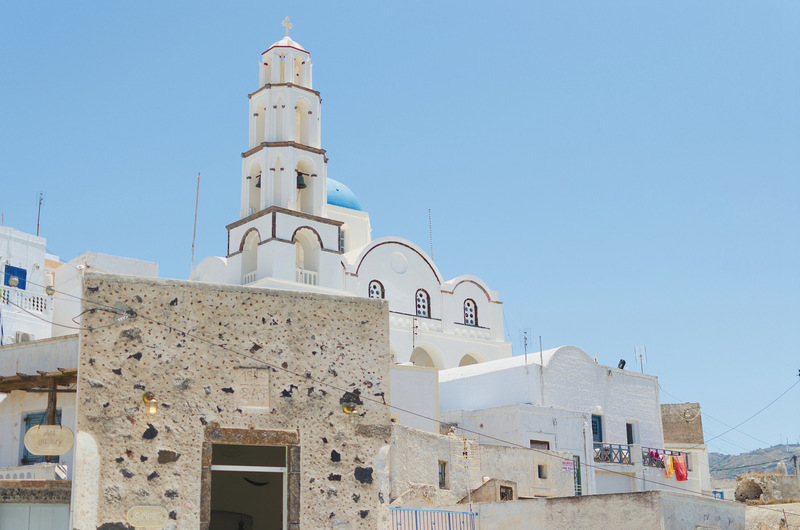 Santorini has many churches all over the island, but this is one of the oldest, having been built by monks in 1711. Plus it has the best views. From its lovely little gardens you can see across the entire island: taking in calderas, vineyards, valleys and the ocean. Enter into the monastery for a peaceful exploration and pop into the shop to browse their selection of local products, including candles, honey, olive oil and wine. What is it? 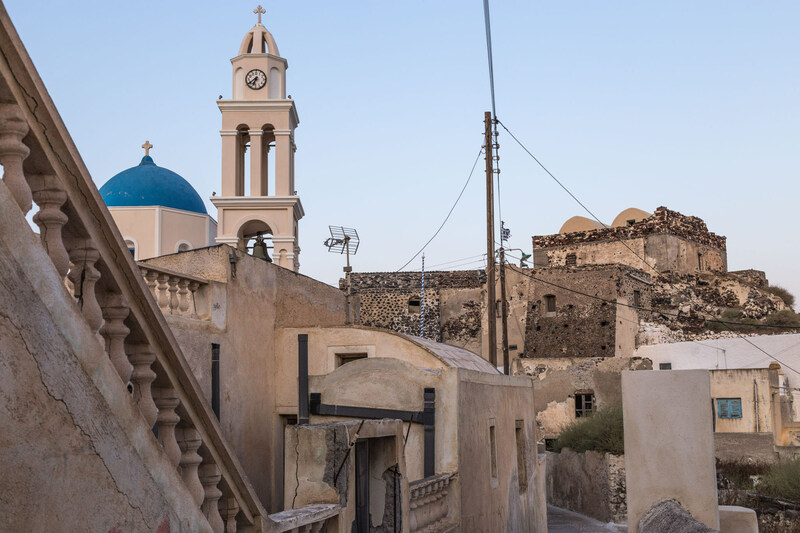 This lesser visited Santorini village offers a glimpse into how locals live. Why go? 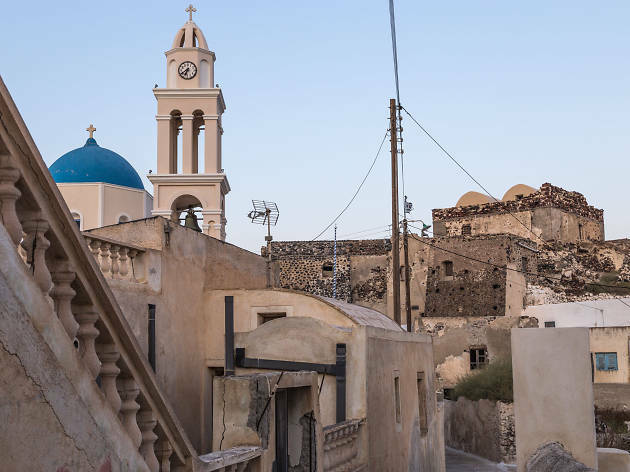 Pyrgos is one of the most charming inland villages on the island. It might be miles from the sea but it has stunning views and a quiet, off-the-beaten-path charm. This whitewashed hilltop village is lined with homes and churches that were built in, and around, a Venetian castle. The tiny winding footpaths here are worth exploring. 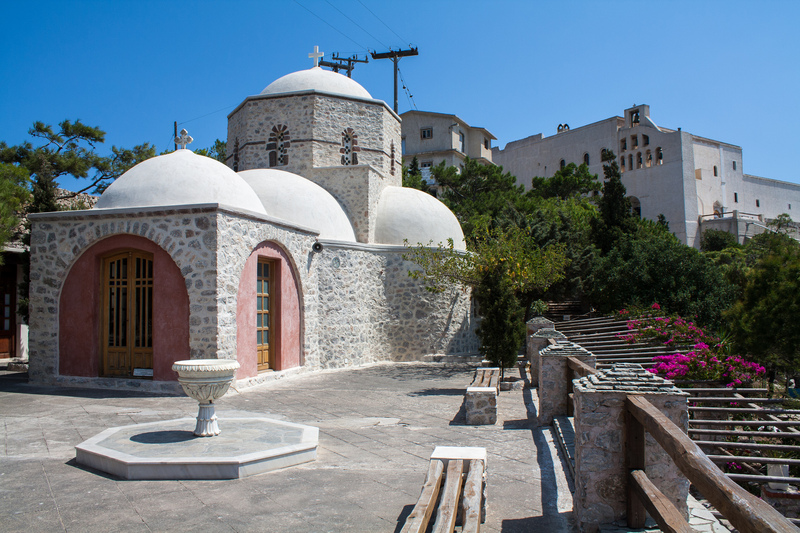 It’s easy to stumble across a scenic café for a Greek coffee break. One of the most highly-rated restaurants in Greece – Selene – is located in town. Come in summer when the dining balcony is open. It’s a breezy, scenic dining spot. 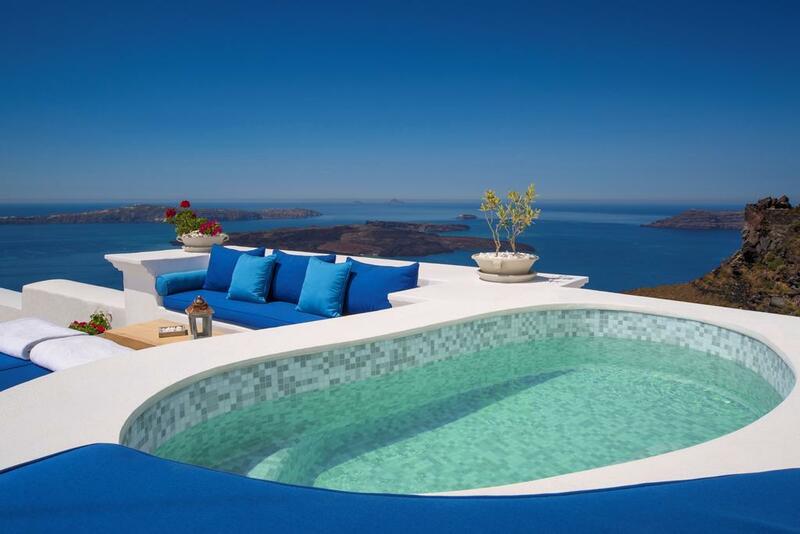 Looking for a place to stay in Santorini? We’ve searched the island for secluded hideaways, laidback villas and luxury boltholes with views that will blow your mind and allow you to unplug far from the madding crowd.